This fabulous Paris apartment is 850 square feet with 550+100 square feet TERRACE overlooking EIFFEL TOWER and ALL OF PARIS from all the rooms and accommodates up to four guests. The view of the Eiffel Tower and Paris from this apartment is simply stunning, it is a 360 view overlooking ALL OF PARIS from all the rooms. The flat comprises 2 terraces, one of 550 square feet and another one of 100 square feet from the main bedroom where you can truly enjoy the views and feel that Paris belongs to you. It is ideal in the summer to relax and have a nice glass of champagne with your loved ones. It is probably the most romantic flat in Paris and it has a very cozy and hospitable feel perfect for friends and family ! The terrace is so spectacular that it would be an amazing setting to pop up the question! ;-) and get an instant yes!!!! It is located on the Seine river in the 16th arrondissement, in the heart of the Right Bank, and surrounded by picturesque shops, cafe's and restaurants all around you. Enter the Seine river apartment into the living room with dining table, comfortable sofa, TV and all equipment. The living room has an en-suite 550 square feet TERRACE where you will have deck chairs, sitting areas for all your meals and a lounge space with cushions, candles and lamps. In the main bedroom, there is built-in closet which offers lots of storage and shelves. It has an en-suite 100 square feet TERRACE with deck chairs. There is a small corridor leading to the bathroom with bathtub, flexible shower, sink, washer dryer and toilet and next to the bathroom there is a cozy bedroom with a double bed, closet, night tables and lamps. On the left of the corridor, there is a separate toilet and sink. The apartment entryway leads on the left of the beautiful living room to the kitchen fully equipped with a nice sitting area and has all the appliances microwave, oven, refrigerator, dishwasher, gas and electric stove. Nespresso machine, toaster, juice centrifuge. There is a nice open air market opens everyday 5 min walk from the apartment where you can shop and prepare your own gourmet meals. Seine River with views of the Eiffel Tower, Champ de Mars and all of Paris creating memories of a lifetime. The location is one of the best in Paris: 10 minutes walk to Eiffel Tower and shops; 15 minutes to Champs Elysees. You are surrounded by restaurants that local Parisians go to, cafés, bistros and shops. There is also a park behind the building to walk, run, play in the playgrounds in a residential area. Open Markets: Passy is one block away, one of the best and most famous streets for food and shops in Paris and opens everyday for fresh baguette, cheese, fruits, vegetables, meat and local products. Fantastic views and great location! The flat has great views from the living room terrace and the bedroom balcony! Plenty of room for 4 people. Kitchen has plenty of essential items. However, the dining area needs more lighting. There are two tall lamps, which can be moved to provide lighting. But it still seems dim, even with the balcony door open. The flat does not have AC but has a portable fan, if needed. The building has a small elevator (2 people max) and there is a small flight of stairs to get to the flat itself. The flat is in a good neighborhood and an easy walk to the Eiffel Tower (20mins). Also very close to the Metro. The only trouble we had during our stay was that it was quite hard to get a taxi or Uber. It seemed like the taxis couldn’t or wouldn’t stop in front of the building. Also, it seems to take forever (15+ mins) to find an Uber ride (not to mention quite costly). Otherwise, overall stay in the flat was great. Would definitely come back! Just returned from our 4th stay at this gem of an apartment. Of course, we come for the view, which is spectacular - pictures don't do it justice. But the apartment has much more to offer. The location is very convenient - at most a five minute walk to a metro station with very frequent trains that take you practically anywhere in the city with at most one easy change. Ubers arrive within a couple minutes and are very reasonable. There are plenty of shops and restaurants within a 5-10 minute walk. The apartment is in a pleasant, residential neighborhood. When you step outside, you will be among Parisians going about their daily lives rather than in a horde of tourists. Beginning and ending your day here makes for a much more relaxing experience. The apartment itself is super comfortable. It is in an older building and has been renovated to retain all the charm of an older place without any of the inconveniences. The kitchen and bath are stylish and modern. All the appliances are top quality and work well. The bathroom is large with a spacious 'American' style shower that is easy to use. (And you can admire the Eiffel Tower while you brush your teeth!) There is ample room for a family of 4 or 4 adults, and the layout makes it easy for some to sleep while others are up and about. Even better, the internet is fast and works well everywhere. Best of all is the terrace, which is huge. Breakfast here on a sunny morning is particularly delightful. 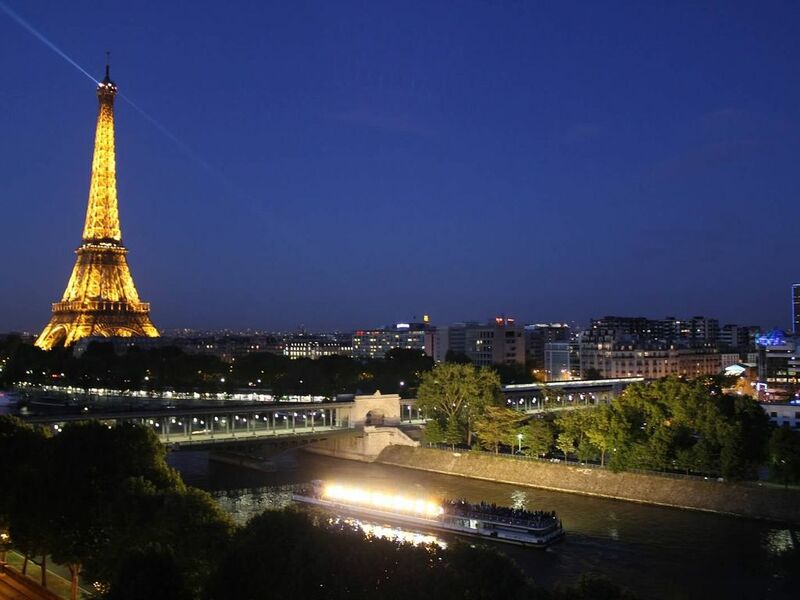 In the evening you can watch the Eiffel Tower twinkle and enjoy the boats sailing the Seine. Relaxing on the terrace, you will feel more like you are at a beach resort than in the middle of a major international city. Truly, I can't say enough good things about the apartment. It won't just give you a place to sleep - it will enhance your enjoyment of Paris. We stayed here to celebrate our daughters 16th birthday and everything was perfect. The flat is in a wonderful location with the most amazing views. We can’t thank the owner enough for sharing this beautiful place with us. The caretaker helped us get settled and everything was perfect. If we ever return to Paris, this is where we hope to stay again. We enjoyed the flat and location to the Eiffel Tower. View of Eiffel Tower from the terrace , master bedroom and bathroom! Market for groceries, restaurants, etc a 10 minute walk from the flat. Two trains within 10 minutes as well from the flat. Hop On Hop Off buses at the Eiffel stop. Great homeaway location! I definitely would come back! This apartment was perfect for my week in Paris with my daughter. The apartment is not luxurious, it is actually pretty quirky, but it had everything we needed (the kitchen is adorable) and THAT VIEW! While the apartment isn't in the center of things (loved being in the 16th), the convenient metro and taxis available all the time, made it is easy to get everywhere. Plus, walking in Paris is the best. The view is simply incredible...wake up to the sun rising behind the Eiffel Tower and enjoy the sunsets with the lights of the tower twinkling and the sky going from brilliant blue to navy. Don't miss the adorable park hidden behind the building - what a gem. Warning, however, is that there is a narrow flight of stairs that you need to climb with your luggage - because this truly is a penthouse. It is one floor ABOVE the top floor of the building. A father, daughter, granddaughter trip of a lifetime! Thanks to Agnes the property owner not only did we ha e a beautiful flat to call home, Agnes sent me many tips about places to eat, things to do and convenient ways to get around. The location was even better than described. I would highly recommend this property to anyone wanting to live in Paris as a Parisian while visiting the city of lights.